TALLAHASSEE, Fla. /Florida Newswire/ — On Wednesday, Fla. Gov. 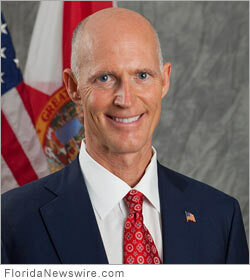 Rick Scott today made the following statement at a media availability, following the resignation of Lt. Gov. Jennifer Carroll: “Local, state and federal law enforcement officials just held a press conference in Orlando, announcing that 57 individuals were charged with illegal activity linked to a $300 million conspiracy orchestrated by Allied Veterans of the World.